July 14th - longest day on tour - transfer day. Hey gang, hate this day annually as its my worst day on tour. 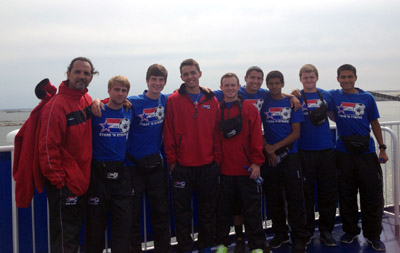 Getting to Sweden and getting all set up for Gothia Cup. 5 am wake up, 6 am departure, 4 hour bus ride with stop for breakfast halfway, then a 3.5 hour ferry crossing which is pretty cool as it like taking a cruise ship. Kids had a blast as they ate, took pics, and did some gambling on slots, etc. nothing crazy but some did win quite a bit of money. North Sea was kind of rough so some did have to lay down and get their bearings, but all in all a great ferry trip. Arrive at Gothenburg at 3:30, quick bus to hotel and then organize our hotel. Hotel Odin, best hotel ever, been there 8 years now, 4 kids to a room, executive style hotel with full kitchens, etc. and of course real beds. 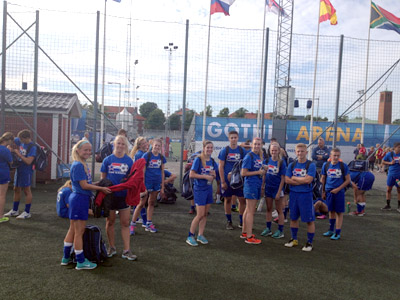 Off to Heden, the center of town for training at 5, back to hotel for dinner at 7, and then registration on the roof top with Gothia cup staff until about 9. Get organized for Monday games as well as opening ceremony, which of course we are marching, soooooooo excited. In rooms at 10, lights out at 10:30. Kids had their phones all day but oddly enough we had some great conversations about the cell phones. Some of the kids actually said that they enjoyed not having their phone as it made them interact more with the people on tour, go figure, sometimes we do get it right. On our way to training we did stop by a Catholic Church and about half of us went in and had a private prayer, etc, kind of cool too. Gothenburg is my 2nd home, 26th year here, and last year was inducted into the Hall of Fame, so lots of friends to see and our SnS kids meeting them too. About 65 degrees and sunny, cool enough for our full sweats and the dinner was outstanding. This will be our best food on tour, although Germany was awesome, but the kitchen staff really takes care of our kids here. Games start early with Boys A game at 9 am so early breakfast.